Captiva St. Augustine was developed by Dr. Russell Nagata of the University of Florida. Captiva is resistant to a number of insects, including all chinch bugs found in the state of Florida and the Tropical Sod Webworm. Captiva St. Augustine thrives under a wide range of climatic and soil conditions in USDA Zones 8b to 11, which stretches from Florida northward to the Coastal Carolinas and westward along the Gulf Coast Region into Central Texas and continues into southwestern Arizona and coastal and central California. Captiva is an ideal choice for residential and commercial use. It has an outstanding dark green color. 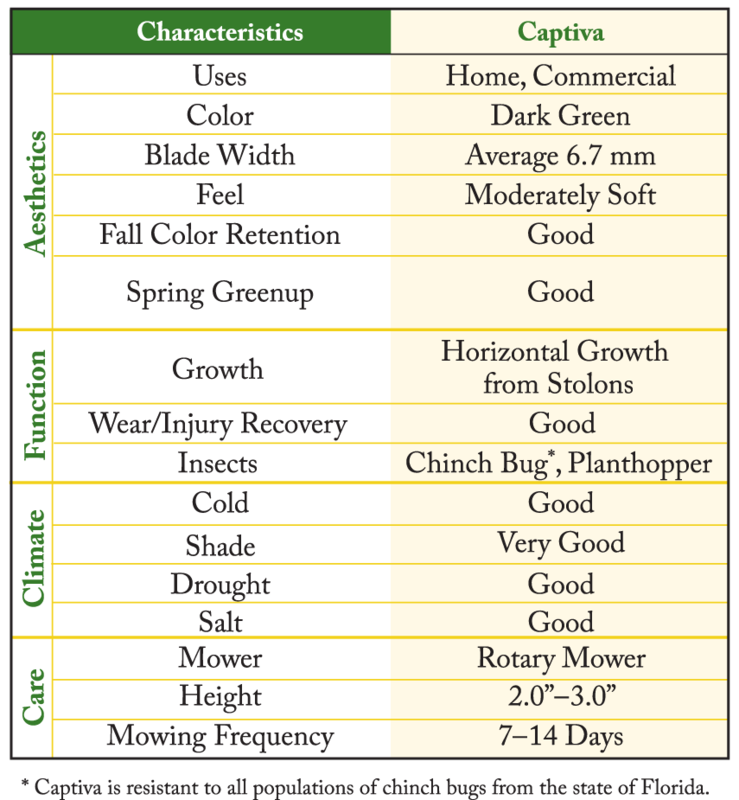 Captiva also has a slow leaf growth habit which dramatically cuts down the need for mowing. It requires 3-4 hours of direct sunlight per day. It holds fall and winter color longer than Bermuda, Centipede, or other St. Augustine cultivars. It will remain evergreen in some areas of the deep South. Captiva St. Augustine also has a massive root system, making it drought tolerant once established. Captiva St. Augustine recovers quickly from damage by wear or minor scalping as it sends out runners to repair open areas.